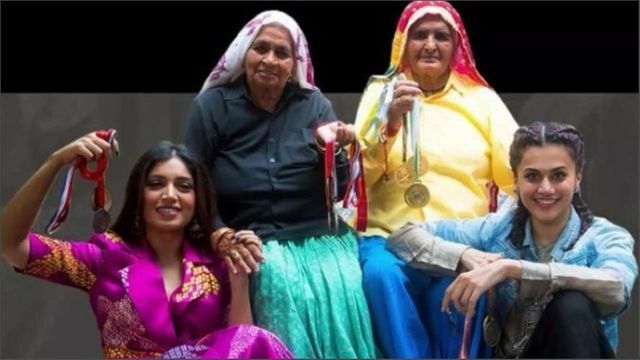 Bhumi Pednekar and Taapsee Pannuare currently occupied with the shooting of their next film Saand Ki Aankh, based on female shooters. In the middle of shooting, the actors manage to take out some time and treat their fans with pictures and videos from the set. Recently, Taapsee shared few behind the scene videos from the set and also revealed that the first look of the film will be out tomorrow. #SaandKiAankh #ComingSoon.” Taapsee went on to share more inside stills from the set. Saand Ki Aankh is about the world’s oldest sharpshooters – Chandro Tomar and Prakashi Tomar. They reportedly took up sharpshooting in their 50s and are called shooter ‘dadis’ for being the world’s oldest female sharpshooters. “ They may be old, but their aim is sure-shot gold! Here's the first look poster.